I didn't know what to expect from falafel made into a chip. Trader Joe's Heat and Eat Falafel was a big hit here on WG@TJ's back in our heyday, May of '11. Tasty stuff. So we knew TJ's could do falafel right. And we've encountered multiple kinds of successful chips from Trader Joe's. True, they're not batting 1.000, but they've done more right than wrong. So we had reasons to be hopeful. 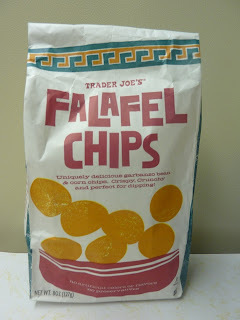 And I must say, these are among the better Trader Joe's chips I've had. Unique. The kind of product that makes you question things. 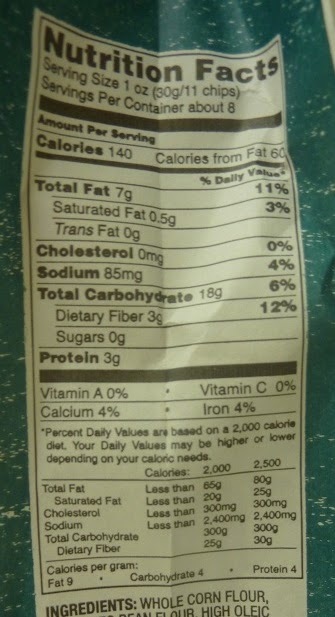 Things like: why do Americans only eat potato chips and tortilla chips, with very few exceptions? Well, because those are the only things that are on the shelf. 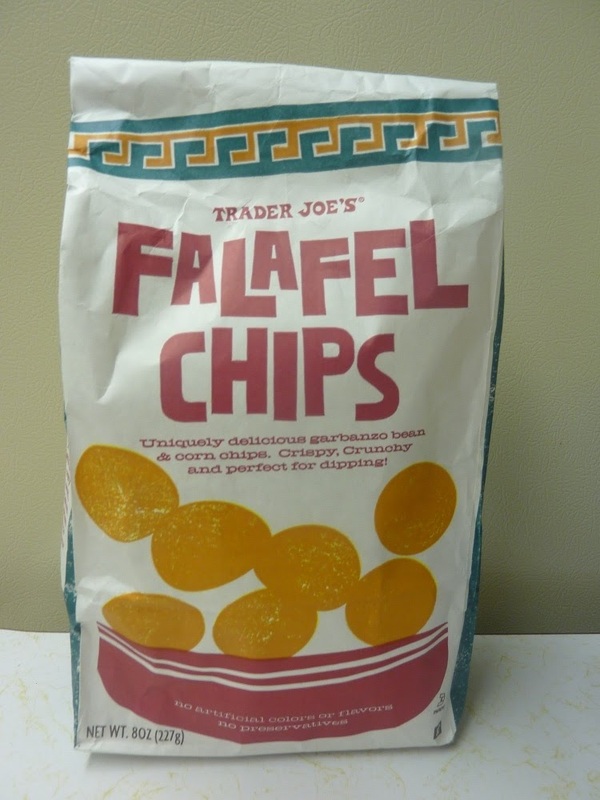 But really, if every shelf in America were stocked to the brim with falafel chips, wouldn't they catch on just as well? Wouldn't brands of falafel chips be airing big-budget commercials during NBA playoffs and Stanley Cup Finals, too? If you eat them, will they not crunch? If you snack on them, will they not produce deliciousness? 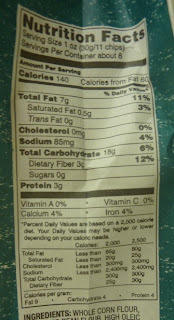 I don't mean to wax philosophical on you when you're reading this to find out my opinion of these chips. I'm just trying to point out the fact that the type of chips we eat is really arbitrary—as life itself can be, sometimes. I'm just tryna' say get over your chip-prejudices, erase your preconceptions, and open your minds. The falafel chip is the brother of the tortilla chip, akin, yes—even to the potato. I actually think these remind me most of the new Tostitos Artisan Recipes Roasted Garlic and Black Bean Chips, which are also very good and worth trying. They're both nutty, crispy, and lightly spicy. One can totally tell these TJ's chips are made of falafel—but only if you're really thinking about falafel right when you're chewing them. If you dressed them up differently and called them "Crunchtastic Critters" and made no mention of ground-up garbanzo beans from the middle east, I highly doubt many people would go, "Oh my goodness, these chips taste just like falafel!" We ate the chips with TJ's Spicy Hummus, but I think they might be equally snacktastic with salsa, bean dip, or cheese sauce. They're firm enough to plow through a vat of hummus, but delicate enough for a sensitive mouth (like mine). Both taste and texture are very good, high-quality. Sonia's going to give them a 4.5 star rating. I can't go much lower than that. 4 stars from me. Ha, that is one of my regular snacks these days - these chips with spicy hummus. So good. at big lots i found these, i think the brand was boulder, chipotle cheddar flavored bean and rice chips. they were fantastic! not sure if the ones you mentioned are similar, but i would choose those over chips any day. Oh, I think these are nasty! I had such high hopes as I've had other brands that were mighty tasty. Target used to sell hummus chips but as with everything I love, they disappeared. Plocky's brand are excellent. I've had to stop myself from purchasing mass quantities from Amazon. Gooood stuff. If TJ's are the only ones you've tried...try another brand. Man, the TJs near me are ALWAYS out of the heat and serve falafels! Such a shame - maybe these will be a slightly acceptable substitute. Hi Alyson, :( hopefully they will have them stocked soon at your local store. These chips are a tasty snack for sure. Surprisingly good with all sorts of dips and salsa. Ate them with the "3 layer" Hummus. Absolutely great!